In the heart of Matsuyama! On to the Study Abroad segment! For the Sustainable Energy study abroad trip, I stayed in the mountain city of Matsuyama. 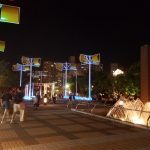 Matsuyama is very much a country city, compared to Tokyo or Kyoto, but It is not like American country cities. 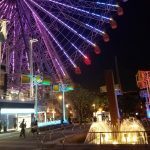 Matsuyama still had a Livid Night life and a ton of attractions for young people. Our group was able to keep busy every single day of the trip. We stayed in a shared housing provided by the university. We each had our own rooms, with air conditioning. Thank goodness! The Humidity is a little dreadful! 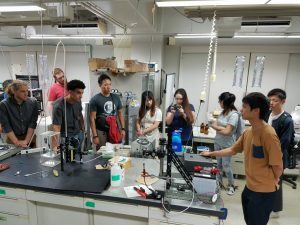 Since this course focused on Sustainable Energy in Japan, most of the studies in this trip revolved around different energy and technological systems in Japan. Each day yielded either a field trip, lecture, or cultural outing. 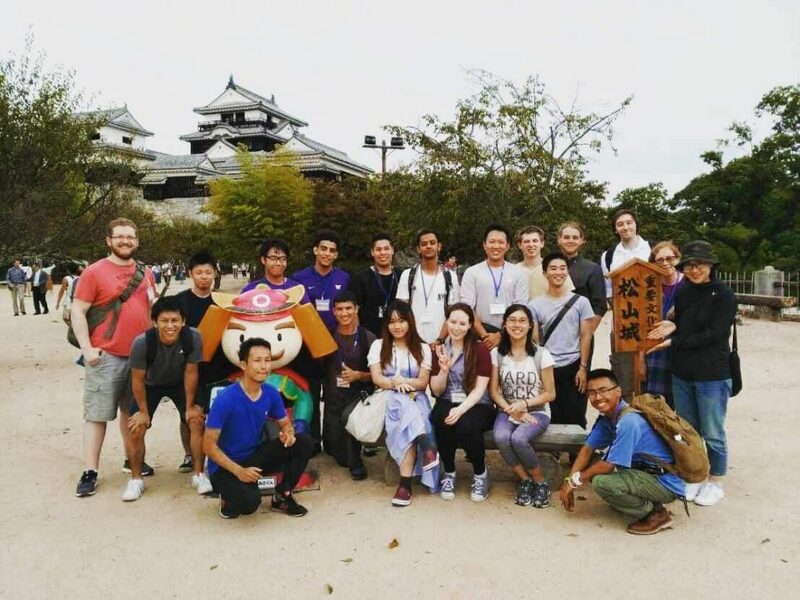 We worked together with students from Ehime University and got to share in each other’s culture. During the Shinto Festival, we all assisted in hoisting the 2 Ton Kami Shrine for the day, with the help of 100 others from around the prefecture. On our field trip to Yusahara, we traveled to a terraced rice farm in the mountains. 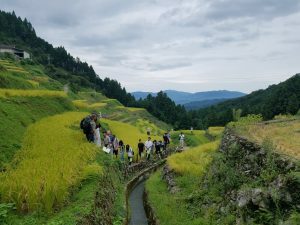 Here we got to learn about the architecture involvement of irrigation in the terraced fields and learned about the culture aspect of Japan’s problems. In Japan, there is negative population growth, meaning that the youth are leaving the smaller cities, leaving only the elderly to perform jobs such as rice farmer. In time, this will have significant problems for Japan. 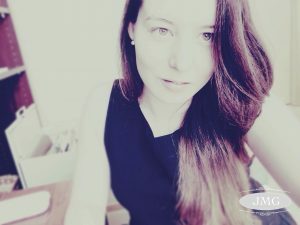 When I began the study abroad, I expected to learn technology in Solar farms, hydro power, etc. While we did learn about that information, we learned a great deal of Japan’s own culture. It was surprising to see different solutions to similar problems. For example, In America we are looking to solar power to increase our green clean energy. For Japan, solar power is not that applicable, so they are looking to Hydrogen facilities to assist in long term clean energy. Studies aside, the most valuable information I learned was engineering from an international standpoint. It really opened my eyes to how things can be completed. Learning the cultural aspect turned out to be even more important than the engineering. During one of the weekends, each student stayed in a homestay with a local family. My family was an older couple in their 40’s with no kids. I was unsure of what to expect, but upon meeting them, I had a spectacular time. Although the husband couldn’t speak good English, his wife was able to translate for us, and we had a lot in common. Conversation proved to be very fruitful and we had to force ourselves to stop talking in order to go to bed. On our day out, we traveled to Kurusan Observatory up on one of the mountain Islands, yielding one of the best views I have ever seen. The Islands of Japan are very mountainous and numerous. Pudget sound Islands look like child’s play in comparison. 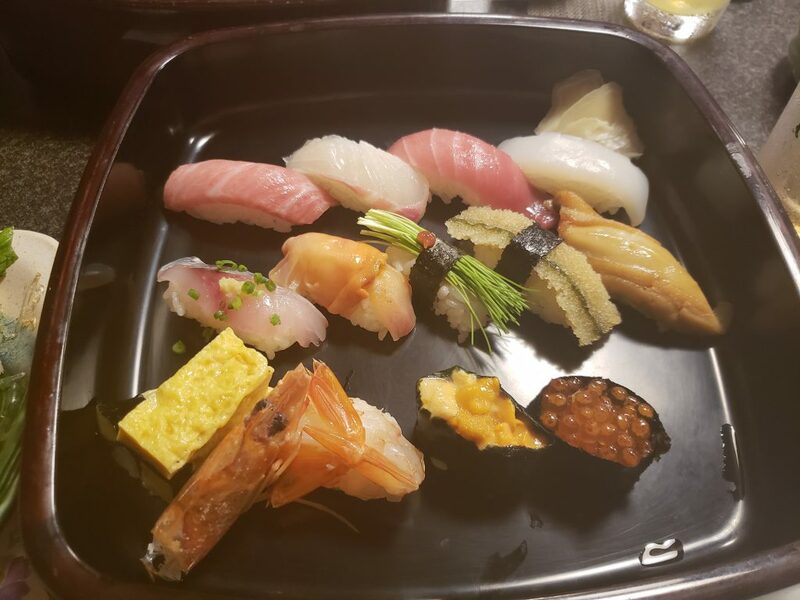 Staying with a local family and eating something other than at a restaurant or 7-11 goodies was a refreshment and a learning experience at how a Japanese household operates. When the homestay was completed, every student had a positive experience with their homestay. 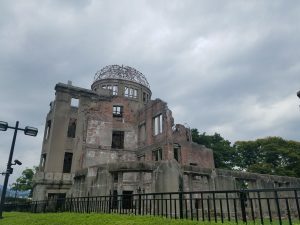 Hiroshima was another big highlight of the trip for me personally. Given the situation of WW2, it always amazed me how far Japan and America have come as allies and I was humbled by the memorial. Seeing ground zero in person was surreal. In summary, staying as part of the Japan study abroad taught me a lot about the international community. I learned about English teaching in Japan. Which I might consider if my current career plans fall through. Advice that I would give for any students looking into a study abroad. I would say to experience as much as you can. Studying outside of America is a limited opportunity and you should take advantage of everything. If it is your first time traveling alone to another country, just remember that it is only a finite period of time. Soon you will return to your home and look back at your experiences. Make sure you fill your time with as many experiences as possible while traveling abroad. It has been 1 week in Matsuyama and 2 weeks in Japan. I entered Japan a week early to do a little solo exploration. 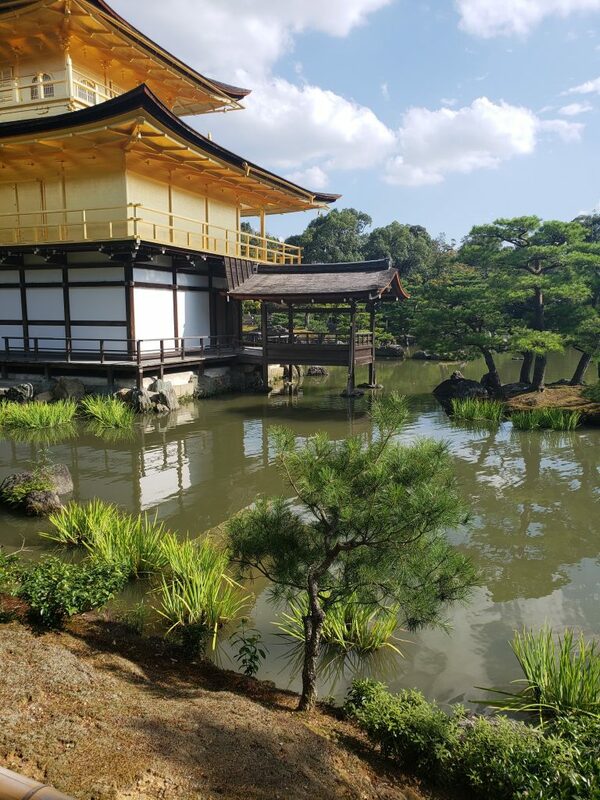 Before starting the school study abroad program, I traveled to the busy city of Tokyo, Climbed Japans tallest Mountain of Fuji san, and explored the cultural heritage in the city of Kyoto. Immediately after landing I traveled to my Air BnB. Air BnB is a website in which locals can submit their houses/ rooms for rent, resulting in an affordable and comfortable way to stay overnight in cities. Only costing me $15 US dollars per night, I stayed in a small room with 4 others, but there were private showers and the locals were very polite and helpful in guiding me to tourist sites. If you are traveling short period to multiple cities, I recommend this method. Most of the day I was out and about and only came to the room to crash in the evening. 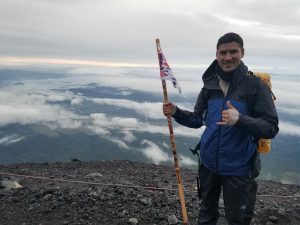 The first item on the agenda was climbing Mt Fuji. I took the highway bus to Fuji, which was very easy to do. And then climbed and stayed over night halfway up the mountain. I woke at 3 am for the famous sunrise summit, and it was well worth it. The climb itself was very long, but not too difficult. A definite recommendation to any hikers out there. Cold and tired after the Sunrise Summit! 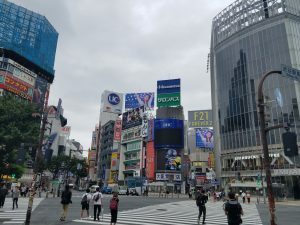 Traveling back to Tokyo, I visited all the main attractions in the city, Shibuya, Ueno, Imperial Palace, Akihabara, and more. Tokyo is a bustling city of modern sophistication. The train system in Tokyo alone was mind-blowing. But to soon learn that the trains connect all of Japan together made me a little jealous that Seattle lacks a rail system. I was nervous that the language barrier would have resulted in large issue. But surprisingly, most of the signs have English translation and I was able to order food by simple pointing and proper greetings. 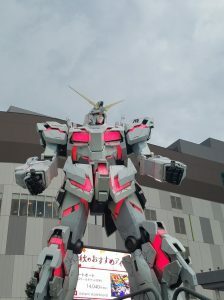 20 meter Gundam at Diver City! I quickly realized that 7-11 stores are your one stop shop for everything you need. They are everywhere. You cannot walk one block without seeing one of these stores. They carry a larger supply of food options compared to US counterparts. They also have ATM’s for when you run out of cash. Always keep cash on you, because not every store will accept American Debit or Credit. Another Helpful Item is Google Translate and Google Maps. Google maps was able to get me to any location I needed to and was very accurate in which train and platform to take. There is a phone app called google translate with real time video translation that will translate foreign signs into English almost instantaneously! Finishing with Tokyo, I traveled to Kyoto via the High Speed Bullet Train, called the Shikansen. From my seat I got to see much of Japan’s countryside which was spectacular. Japan is very mountainous with lots of rivers, making for a beautiful sight. I found myself liking Kyoto a little bit better than Tokyo. 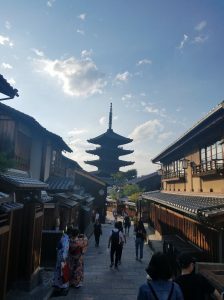 Kyoto had an older cultural feel to the city with a lot more attractions to my liking. Whereas Tokyo was modern, technological, and fast paced. 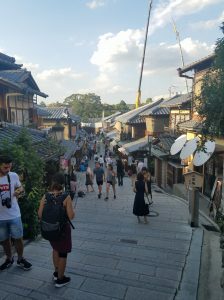 Kyoto was ancient, old, and a slower setting. There must have been a festival of some sort, because all the locals wore Kimono’s. I traveled throughout Kyoto via the city bus, which was also very easy to use. 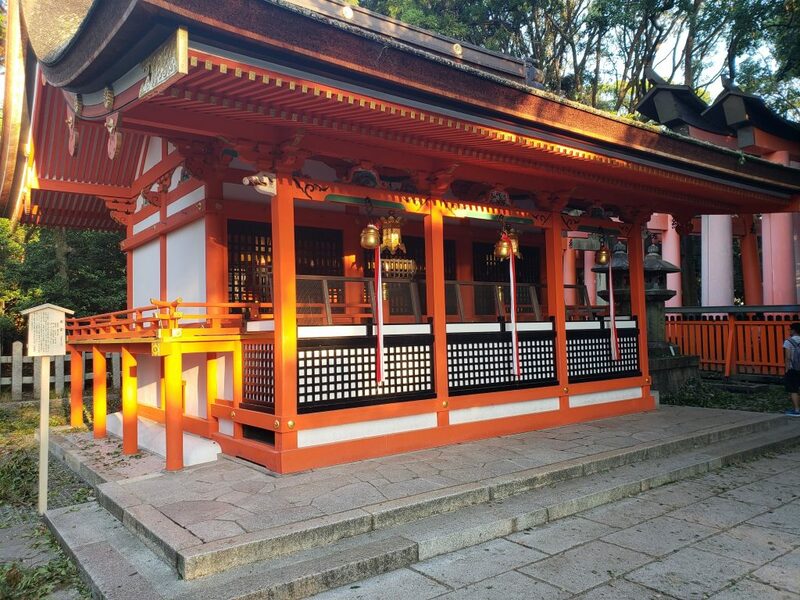 The temples of Japan hold a very serene and ancient feeling. I couldn’t help but stare in amazement at the architecture. It was more appealing to learn how advanced the buildings really are. They are constructed to be earthquake proof. Built without nails so that the wood beams can mingle together during a quake. In summary, traveling solo in Japan was a great time, I was able to cover a lot of ground that wouldn’t have been possible in a group. I felt safe at all times and never felt lost because the locals are very polite and willing to help. Japan’s primary tourist attraction is food. There are a lot of items that have strange appearances, but you must try everything! 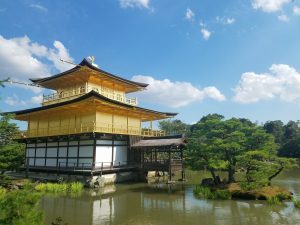 Blog by Cameron Locke, environmental studies, Japan Renewable Energy. My name is Cameron Locke, and I’m an environmental studies major in my junior year. This program originally piqued my interest because of two words: “Japan” and “Renewable”. I’d heard of this program for well over a year as I did orientations for my job on campus and I finally decided that I would apply. Mechanical engineering and environmental studies sounds as different as apples and oranges. Yet there I was, hoping to see the environment from a couple new perspectives. The image that many people have of Japan is this amazing, high-tech society, and I was curious as to where Japan stood in their efforts to put renewable energies in place. you’re at the share house (trust me, you’ll want to wash your clothes often). 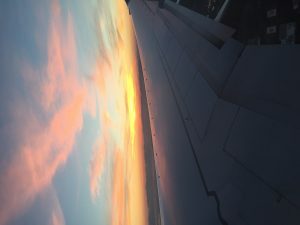 The pre-departure for this study abroad was probably the most worried I have ever been when traveling. 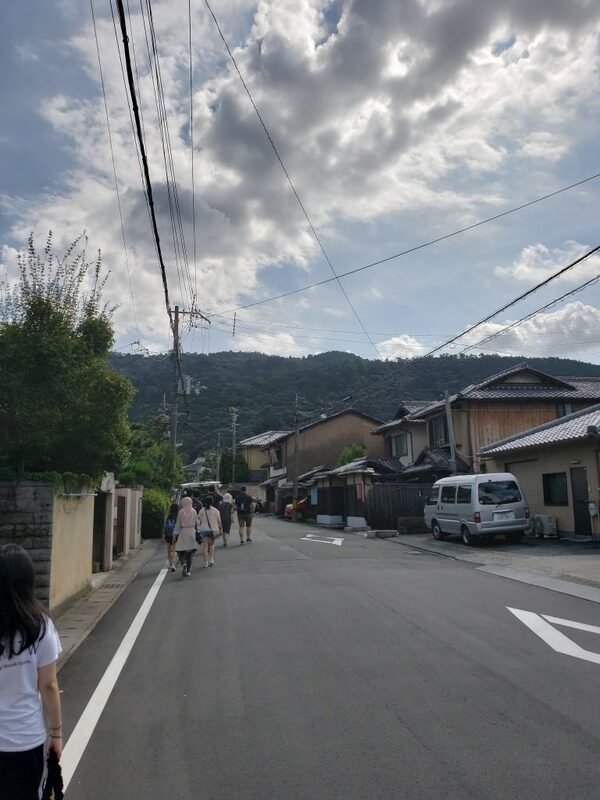 I travelled with a couple other classmates, and we were due to arrive in Matsuyama a day earlier than most of the other students in the program. It wasn’t so much the packing and making sure that I didn’t forget anything as much as it was Typhoon Jebi passing over Japan during the days of my flight. I fully expected delays in LAX, but our flight departed as scheduled. The typhoon seemed to have scared off quite a few passengers because our plane was fairly empty. This allowed passengers who were cramped together to take a different seat of their choosing for the duration of the flight with no extra cost. 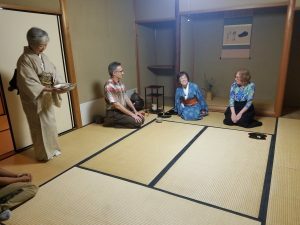 Upon our arrival in Matsuyama, we were greeted by one of the Ehime University students who would take us to the share house. 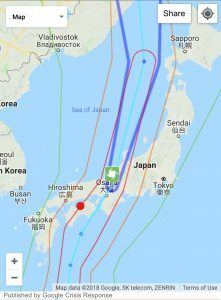 Sept 25, 2018, Blog by Jessica Gray, Mechanical Engineering, Renewable Energy in Japan. 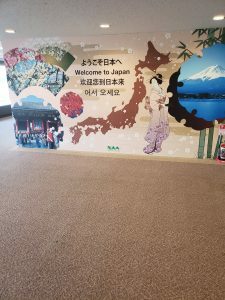 Welcome to my 2018 Japan travel abroad blog. School. University of Washington Bothell. Senior Mechanical Engineering student. Engineers are trained problem solvers, and thats what I want to do. I want to make a positive contribution to the world. Me. i am an artist. an engineering student. a soccer player. I completed an internship with A.I. Solutions/NASA this summer before this course. Program. Sustainable Energy in Japan. This summer consisted of field trips to electric and power companies, power plants, and looking into hydro, solar, wind, geothermal, hydrogen fuel cells, and nuclear power. This course focused on both current and proposed energy solutions–both in the US and Japan. It introduced me to something crucial: the larger picture. When looking at realistic energy solutions, the technology itself is important, but the success of a developing technology is heavily dependent upon so much more than that. Location. Safety. Sustainability. Reliability. Politics. History. These are just some of the topics that influence the power generation industries in vastly different ways depending on where you live, and I got to learn so much about all of these issues. I will post again soon with pictures from the US field trips, and then from Japan. 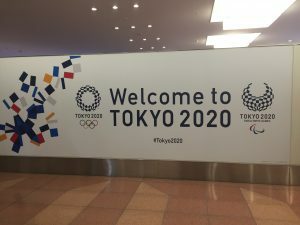 Our time in Osaka just seemed to fly by! We slept so hard the night we arrived, but jet-lag had us up early. Dan and I had decided to not plan anything for the day since the travel would be so long and we wanted to be well rested for our adventures. As a condition of our Airbnb stay, Dan had to sign a lease agreement and we had to meet the landlord. This seemed odd, but we went with it, thinking the meeting would be brief. He came at around 1pm. His name was Mika and he was a cute little old Japanese man who spoke no English. He and Dan exchanged a few words, and the next thing I knew was that I was being shuffled into the back of Mika’s car. I wasn’t necessarily concerned, but I had no idea what was going on. 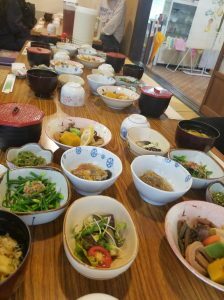 After a lot of Google Translate (which has definite limitations) and a call with an English-speaking friend of Mika’s, we finally found out that he wanted to take us out to lunch! We expected that Mika would be taking us to eat somewhere nearby. He kept driving and driving until we reached a nondescript deserted dock on the river with no business front buildings nearby. Where could this guy possibly be taking us? Also, it was over 100 degrees with 70%+ humidity. It turns out that the dock was for a municipal ferry to take us across the river. It was a free service and it was pretty cool. We walked through the park on the other side, letting Mika lead the way. Mika had to walk slowly because of an apparent degenerative bone disease, so we followed at his pace. Finally, we got to where he was taking us! He took us the shopping center near the Osaka Aquarium (Kaiyukan). He gave us a tour of the area and even paid for Dan and me to have a lunch of ramen. It was a very sweet and very unexpected welcome to Japan. We were incredibly tired by the time we made it back to the Airbnb though, which was around 5pm. We crashed hard for about 13 hours. I was so excited for the next part, which was Universal Studios Japan! 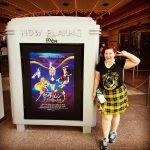 We got up pretty early, donned our Hufflekilts (long story), and headed to the land of Harry Potter, Jurassic Park, Jaws, Minions, and (my personal favorite) Sailor Moon! We got there before the park opened to get our tickets and fast passes, then had breakfast at Eggs ‘N Things, which was amazing. Even at 9am, it was hot. Like, really super hot. But I was not going to let the heat get between me and Sailor Moon! The ride was amazing, even though it was all in Japanese. I had a great time and spent waaaaaayyy too much money at the gift shop. I’m not even sorry. We had a lot of time to kill before our timed entry to the Harry Potter area of the park, so Dan and I walked around a lot observing the people in the park. The level of fascination people, particularly Japanese people, have with Minions is truly incredible. 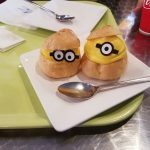 We got a snack that were Minions cream puffs and they were, of course, banana flavored. I also had the joy of taking Dan on the classic Jurassic Park ride, which is really a must. It was so much fun! As we were tooling around, some clouds began to roll in and the wind kicked up a bit. This was welcome to us, because the heat marginally decreased. As we rested on a park bench, an announcement came over the loudspeakers in the park. 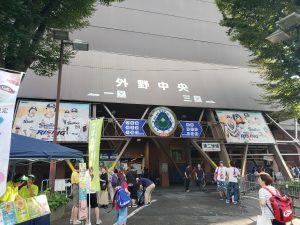 Apparently, there was a Typhoon coming and they would be closing the park at 6pm! Our entry to Harry Potter was at 6:10! I could not come all the way to USJ and not see Harry Potter land! Plus, we had paid a considerable amount for the fast passes for the rides, which we didn’t expect could be refunded and we had no time to come back. It would be our luck that a typhoon would come on the one day we came to USJ. We decided to head over to the area to see if they would honor the passes before the park closed, and they did! So, we got to spend 45 minutes in Hogsmeade before the park closed. Rushed, but better than nothing. The ride was fun, but it was really odd to see Harry Potter Characters (especially Hagrid and the Sorting Hat) speaking to us in rapid Japanese. After that we grabbed some McDonalds and got a train back to our lodgings before the typhoon hit. We fell asleep almost immediately, and I slept really hard until the next morning. When I woke up the sun was shining… I had missed the typhoon entirely. I’m not sure it really ever existed. The day after that we decided to visit the Osaka Castle. 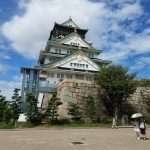 I went to the Osaka Castle when I was 13, and it was just as beautiful as I remembered. The weather was off and on, and it was still so swelteringly hot that it exhausted us quickly. How can a person sweat while it is raining? 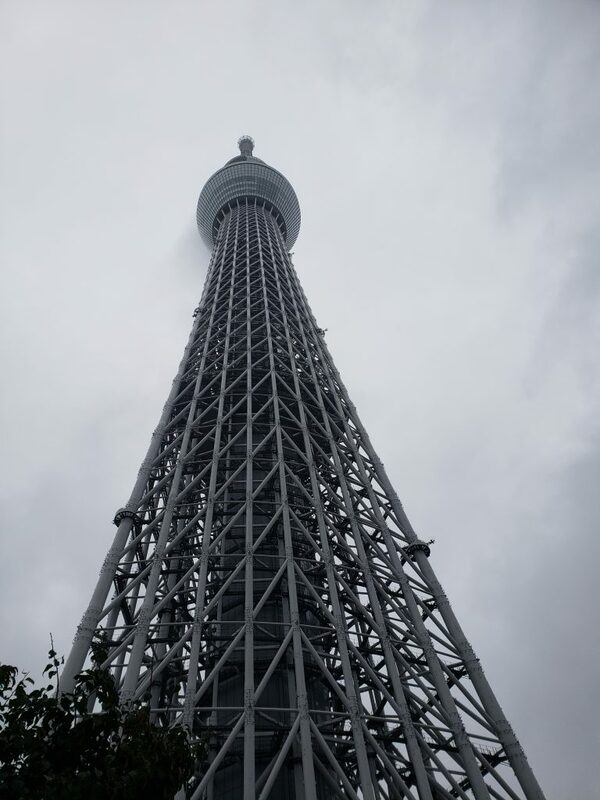 We also picked up a few bug bites, but we had a really nice time seeing such an important Japanese national landmark. I enjoyed re-learning about the history of the Castle (which was restored in the 1930s. It is the 3rd time it has been built! ), and we got a special coin and a magnet for our collection. After the Castle, we were so thirsty! Luckily, Japan has a lot of vending machines everywhere. We trotted over to one at the base of the castle and got a Tropicana peach-orange blend. It was one of the best things I’ve ever tasted! I’m not sure if it was the moment of needing to quench my thirst or the need for some vitamins or what, but that drink will haunt my memories when I return to the US. I will pine for it, I’m sure. The next day was Saturday and we ambitiously decided to fit two activities into one day. First, we made our way to Nara to visit the famous Nara deer. For anyone not familiar, there are hundreds of freely roaming deer in the parks of Nara. The deer are considered the messengers of the gods and are treated with respect. The deer are also very friendly and are not afraid of people. 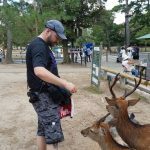 We bought some deer biscuits (okay, a lot of deer biscuits) in the park and had the most magical time feeding the tiny little deer! They knew we had treats and they were very insistent on being fed. One even nipped at my shirt as I tried to get the paper off a package of the treats, while another poked me in the backside with his antlers! The deer were everywhere! We could tell they were also affected by the heat—they were lying in the shade of the trees, and a few were rolling in some mud to cool down. Sadly, we had to leave the deer. I didn’t want to, but we had other things on the agenda for the day. Dan and I loaded up on kawaii souvenirs and headed back to Osaka on the train. Side note: if you are planning a trip to Japan in the future, be sure to get a JR rail pass. They are available to foreign visitors and they allow you unlimited use of JR trains for the time they are active. So worth it. 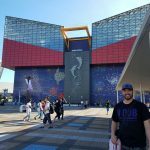 When back in Osaka, we made our way back to the Kaiyukan Aquarium. One cannot visit Osaka and not go to the Aquarium! I was so excited for Dan to see it, and neither of us were disappointed. The way this aquarium is set up is just brilliant! It is 8 floors, with tanks that stretch between floors, so visitors can see in the tanks on multiple levels. The center tank was the largest because that was where they kept the whale sharks! There were several other species of sharks, rays, and other fish in there too, but the whale sharks were simply amazing. We had such a great time wandering down all the exhibits, and when we came out the sun had set and the plaza was lit. It was a great end to our stay in Osaka. The next morning Dan and I got up and left the Airbnb. Dan had shipped our big luggage ahead to Tokyo, for which I will be forever grateful. I couldn’t lug all that back up to Tokyo… never again! We hopped on another train to the Yamazaki Whiskey Distillery, where they make Hibiki (a whiskey we like to get back in the states. Thanks Costco!). They had a museum, and it was really cool to learn the history of Japanese whiskey making which is relatively new. We even got to do a whiskey tasting. Strangely though they didn’t sell much whiskey in the gift shop… at least we know that we can get some back home. With that site checked off our list and a toast to the completion of the first leg of our journey, we caught a Shinkansen (bullet train) and headed to Tokyo to officially start our study abroad program. 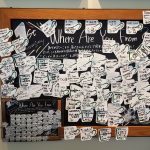 Board at Starbucks near Osaka Castle. Can you see where ours are? 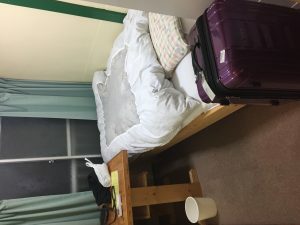 As I write this I am sitting in a cute little Airbnb bedroom in Osaka, Japan. What an adventure it was to get here! We left Stanwood, WA, at 7:30am on Monday August 20th. My boyfriend, Dan, is also on this trip with me and his parents offered to drive us to the airport, so we stayed our last night out at their house (and with our cats!) to make the process a bit easier. The drive to SeaTac was long, but oddly traffic wasn’t that bad for Seattle. What was bad was all the wildfire smoke that was just choking the life out of the city! I was glad to be getting away from the poor air quality. We arrived at the airport before 10am for a 1pm flight. The counter for our airline (ANA) wasn’t even open yet! I don’t think I have ever been so early for a flight before, but I can’t say that I’m upset about it. I’m usually the person scrambling to get to the gate on time, so this was a nice change. We watched as the staff set up the counter for the day, putting up signs and even placing flowers on the counter. Once they were ready to take bags the whole crew lined up in front of us and bowed. Everyone was so friendly, and the check-in procedures were so smooth! We made sure to compliment them on the service before leaving the counter. Security was alright, since both Dan and I have TSAPrecheck, but they still pulled him aside for extra screening. They thought his neck pillow was suspicious… hmm. After that getting to our gate was a breeze. We ate some food and chilled in the ANA lounge, where there was free snacks and drinks. We finally boarded our plane for a non-stop flight to Tokyo/Narita and we left smoky Seattle behind. We couldn’t even see Mt. Rainer as we left. The experience flying with ANA as opposed to an American domestic line can’t even be compared. We were in premium economy seats, which we decided to get because the flight is so long, and Dan is very, very tall and he needed the extra leg room. It was completely worth every penny. The seats were fairly comfortable with a decent amount of leg room and bin space. We were given pillows, blankets, and even a pair of slippers to wear during the flight! The service was exceptional, and the food was delicious, which is unusual for airline food. I will for sure be flying with ANA again and I recommend it to anyone flying to Asia. The real adventure started once we landed. We had to go through immigration and customs. I don’t know why, but every country I go to seems to think it is okay for the immigration room to be a thousand degrees. Several flights had landed at the same time and we all filed in tight lines to be processed, but it was incredibly hot with no air moving through the room whatsoever. We stood in line for about 30 minutes, which isn’t bad for immigration really, but I was a sweaty droopy mess by the time we got through it. After that customs was a breeze and we set off into the airport once again with our bags. The first thing we had to find was our pocket wifi, which we had reserved online in advance. In Japan here is no free public wifi and we didn’t want to pay for pricey international plans for our phones, so the pocket wifi is a must have. However, no one could tell us where to pick them up! The company we reserved them through wasn’t with the other wifi rental counters and we had no idea what to do. Finally, we found some visitor information staff that helped us find out that our devices would be on the fifth floor, which was a major relief. I never would have suspected if someone hadn’t been able to tell me. We also purchased Japan Rail passes for the next week, which is another must have in Japan. You can get just about anywhere on the train. Dan and I got our tickets to Osaka, which is where we will be doing some fun stuff before our program starts. 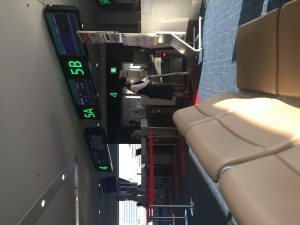 We had to rush to get to the Narita Express from the airport to Shinegawa to connect to the bullet train. This was a bit hard for me. I’m not the most fit person in the world. I had two knee braces on, a heavy backpack, and two suitcases to lug about (one carryon, one full size). We had also been travelling for about 15 hours at that point and I was super tired. We had to board at the front of the train all the way down the platform and there were textured tiles on the platform that prevented the wheels on our suitcases from working very effectively. I had dropped my ticket in the rush and I hastily bent down to pick it up, but I forgot how heavy my backpack was and I toppled right over. I fell right onto my left knee. It hurt, but I couldn’t really stop. I popped back up and we rushed to get on the train just in time. This first train ride went by in a bit of a blur. Dan and I didn’t do much but stare out the window for an hour. Once we got to Shinegawa, it was another race to our bullet train to Osaka. It got harder and harder to push my bags along and Dan had to help me a lot, for which I feel both grateful and guilty. Being in Japan for a month means that you need your stuff to make it. We packed relatively light, considering that we would be there for 32 days, but there are still essential things a person needs. 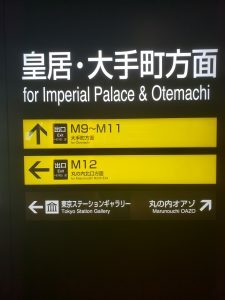 We had originally planned on storing our large bags with a company until the 26th and living out of our carry-ons in Osaka, but we were so rushed to get to our trains that there was no time to sort that out. We didn’t even have time to buy any food. So, in the end all of our luggage came with us to Osaka. On the bullet train I ended up falling asleep for a bit. It was so hot, and I was hungry and exhausted. We made it to Osaka station and switched trains once again to get to our final destination. Once we stepped outside the station I immediately began to sweat. I knew it would be hot and humid in Japan, but I was not at all prepared for the reality of it. Dan and I walked about four blocks to our Airbnb with our bags and we were both completely soaked by the time we got to the place. Dan heroically got our bags inside, but it was a compete oven in the little house. Every room had an air conditioner, but they weren’t on and there were no instructions on how to turn them on. Dan had to mess with them for about an hour and a half to get them to work. I actually started to cry once he got one working. I was drenched in my own sweat, starving, in pain, and exhausted. We had been travelling for nearly 24 hours at this point. Dan was so frustrated with the air conditioning situation and I couldn’t blame him. He had taken off his shirt and I could see the sweat rolling down his back, and on top of all the hard work he did getting us to our accommodations he also took care of me. He ran out to a 7-11 and got us some food and water so we wouldn’t die. I don’t know what I would have done without him there. I’m a grown woman, and I can usually take care of myself, but I was so overwhelmed that I could barely function. After eating a wonderful meal of katsu and rice balls, we finally went to bed. We will have to use separate rooms though, because the beds are tiny and there is no way we could both fit in one. And here I sit after finally getting some rest. I feel much better, but I definitely learned some valuable lessons this time around. I am unused to travel like this, but I hope to do it more in the future and what I have learned over the last 36 hours should be very useful for the next trip. For today, however, we plan to rest and get used to the time difference. Japan is 16 hours ahead of Seattle, but I think we can manage. We will need to be fully recharged for the rest of our adventures in Osaka! 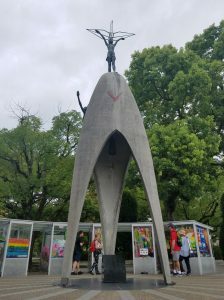 August 16, 2018, Blog by Rebecca Angelsey, Program: Honors Japan: Construction of Japan Identity- A Comparative Look at National Narrative in Japan and U.S. I am so excited to be able to participate in a study abroad program while attending UWB! I never thought this experience would be a possibility for me, so it is really a surreal experience. To make everything even more magical, my boyfriend, Dan, has been accepted to the program as well, so we will be able to share this amazing experience together! I chose this program for a few reasons. First, it was the most practical. It fit into my major, which is Society, Ethics, and Human Behavior. It also was very well timed to allow me to graduate at the end of fall quarter. But the second and more important reason that I chose this program was that I have always had an enduring fascination with Japanese culture. When I was young my parents volunteered us to be a host home for Japanese homestay international students. For a few weeks every summer we would have a young person from Japan come and stay with us. We would have so much fun learning from them, but also teaching them about our small corner of the world in Western Washington (Hoquiam, specifically). Once we even had a slumber party at our house full of teenage Japanese girls! I had so much fun that when I was 13 my parents sent me to Osaka to participate in a homestay of my own. It was the first time I had ever been on a plane or traveled without my parents. I was excited and terrified at the same time. 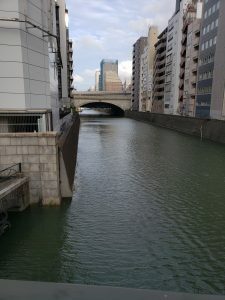 I was in Osaka for 10 days and I have never forgotten that experience. My host family was absolutely wonderful and welcoming to me. They had two daughters my age and we went out and had an absolute blast in the way only young girls can. The day before I left, my host family gave me a Tiffany necklace, so I would always remember my time in Japan. I promised that someday I would return. In four days, I will be fulfilling that promise. It has been over 18 years since I was last in Japan, and I still wear that Tiffany necklace regularly. Every time I put it on, I am filled with memories of learning, laughter, and a friendship that stretched across two cultures to show me how the world outside of my little town could be. For now, Dan and I are just filled with the excitement and flurry of long-term travel. There is so much to do and take care of! Our cats will be staying with family, so we have been making arrangements to make sure that they will be comfortable somewhere else. Otherwise we are dealing with all the other adventures in preparation: bank notices, packing, planning activities, preparing for coursework, and a million other things I am probably going to forget until we land in Tokyo. And now I should probably get back to it!